#ThatBusinessShow wraps up week 25 on 1250WHNZ – the show airs daily at 8am and can be heard On Demand all over the web including my YouTube channel where we put all the videos which are streamed live in studio https://www.youtube.com/user/jamiemeloni and you can find audios on iTunes by searching That Business Show and on http://www.tampabayradio.com! Today’s show got fashionable as I, along with co-Host Stella Giudicelli, welcomed Patty Soltis and Elaine Sweeney to studio. Both are Managing Directors of STYLEdge Fashion, a consulting company they launched in January of this year that offers services including Executive Consultancy, wardrobe setup, closet transformation and many others centering around fashion. Patty has many years of experience in fashion, bringing with her years of experience with the likes of Neiman Marcus, Lord & Taylor and Marshall Fields. Her partner, Elaine, is a recognized fashion icon in the Tampa community and former news anchor appearing on Fox, NBC and ABC affiliates. Their goal is to help women of all sizes and styles feel confident in their appearance which equates to success. They also assist men in wardrobe guidance as well and speak on this during the show also. Patty and Elaine share some tips on making first impressions and the importance of always being presentable on this segment as well as touch on some of the trends in fashion, both from a female and male perspective. They have also started the STYLEdge Syndicate, a local fashion club that will hold eight meetings a year but they stress they will not be “meetings” but rather fun events to share ideas and get advice on clothing, alterations, styles and much more. The cost is $200 to get involved in the group and to learn more, contact Patty and Elaine directly. You can learn more about them at http://www.styledgefashion.com and they are available via email at patty.soltis@styledgefashion.com / Elaine.sweeney@styledgefashion.com phone numbers are 813-362-9061 / 813-468-0424 as well. 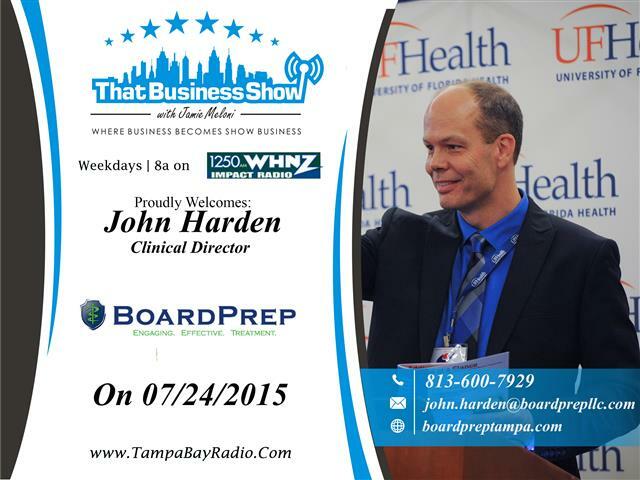 My guest on the 2nd half of the show as John Harden, Principal Investor and Clinical Director of BoardPrep. BoardPrep is a behavioral health company specializing in safe and effective alternative treatments to addiction. John, who himself is a recovering addict, feels that addiction is the most vexing public health problem of our time and elaborates on this and the how his treatment therapies differ from traditional methods often used inside hospital and big box treatment facilities on this segment. John opens the segment with his personal story of addiction to alcohol and cocaine, becoming afflicted with the disease in his teenage years. After going through recovery at such as young age, John dedicated his life to its treatment and today has a stellar resume which includes being the first Executive Director of the UF Health Florida Recovery Center as well as serving as the Executive Director of the Florida Society of Addiction Medicine. One of BoardPrep’s alternative therapies include outpatient services where patients can be treated at their homes and John discusses this approach to treatment on the segment as well as delves into some of the basics of addiction disease such as why some drugs cause addiction more rapidly and why some people are affected by addiction whereas others are not. John also touches on how the brain reacts to addictive substances and we discuss how food addiction affects the brain in the same ways as alcohol and drug addiction. BoardPrep’s facility is located at 2522 W Kennedy Blvd Tampa and you can call them at 813-600-7929 or 1-800-520-8475 to schedule a consultation which takes about 2 hours to discuss treatment if you or a loved one has the need. Learn more at http://www.boardpreptampa.com! This entry was posted in Entrepreneurship and Business and tagged addiction, addiction treatment, boardpreptampa, branding, business, entrepreneur, fashion, styledge. Bookmark the permalink. ← Show Recap – Take the Worry and Stress Out of Traveling with Tips from Carol Margolis and Charlie the Plumber!